Racine: Whitman, 1943. Bound in blue boards, stamped in orange in bright yellow dust jacket. Decorated end papers. The book and the dust jacket are just about perfect -- so scarce thus. A 248 pp. illustrated with full page illustrations. . Reprint. Hard Cover. Near Fine/Near Fine. NY: Tempo Books/Grosset & Dunlap, 1975. Tight, clean copy of the first edition of this Richie Rich title (this is a paperback original). A book of comic stories. . First Edition. Soft Cover. Near Fine/No Jacket. Trade Paperback. NY: Nostalgia Press, 1976. Bound in illustrated boards, lacking the matching dust jacket. Tiny bit of scuffing to bottom edge of spine, but overall in very nice condition. 128 pp. Illustrations in black and white. . First Edition. Hard Cover. Very Good +/No Jacket. 4to - over 9¾" - 12" tall. NY: Nostalgia Press, 1974. Bound in navy blue boards with colorful dust jacket. A moderate amount of chipping to spine ends of dust jacket, but still acceptable. Approximately 144 pp. Illustrations in color. Originally published comics from 1941-1943.. First Edition. Hard Cover. Very Good ++/Very Good. 4to - over 9¾" - 12" tall. Boston, Massachusetts, U.S.A.: Abrams Comic Art, 2009. Bound in black cloth and green boards, with artsy dust jacket. 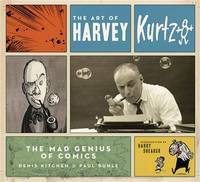 Tight, clean copy of this great book on the art of Mr. Kurtzman. He did a lot of Mad Magazines, Help, Little Annie Fanny, etc., etc. 251 pp. . First Edition. Hard Cover. Near Fine/Near Fine. Oblong 4to. NY: Nostalgia Press, 1974. Bound in red boards, stamped in gold. Dust jacket shows a nickel-sized chip to bottom of rear panel and some scuffing to extremes, but shows well now protected in mylar. The rather scarce first volume in this reprint of the early comic strips. Unpaginated, but approximately 160 pp. . First Edition. Hard Cover. Very Good +/Very Good +. 4to - over 9¾" - 12" tall. NY: Pantheon, 2010. 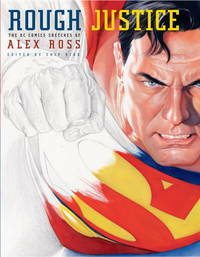 Bound in illustrated whie cloth, with colorful Superman illustration. Great Comic Sketches by one of the masters of the genre. Unpaginated, but approximately 225 pp. of pure drawings / designs primarily of DC Super Heroes. Quite scarce. . First Edition. Hard Cover. Near Fine/Near Fine. Illus. by Alex Ross. 4to - over 9¾" - 12" tall. VA: Barrier, 1979. Tight, clean copy of this 56 pp. magazine re: Animated Films and Comic Art. Bound in stiff colorful wraps.. First Edition. Soft Cover. Near Fine/No Jacket. 4to - over 9¾" - 12" tall. Fairfield, CT: Cartoonist ProFiles, 1994. Bound in stiff wraps with Barney Google cartoon on the front panel. This is a quarterly magazine for cartoonists, comic strip artists and collectors. 84 pp. The "featured artist" in this issue is Fred Lasswell who was the cartoonist for Barney Google and Snuffy Smith for over 50 years. It is nicely inscribed, signed and dated to his cousin on an autograph page near the middle of the book -- a great tender (and neat) inscription. . Inscribed and Signed By Artist. First Edition. Soft Cover. VG+/No Jacket. 4to - over 9¾" - 12" tall. Magazine. Northampton, Massachusetts, U.S.A.: Kitchen Sink Pr, 1994. This is the first edition of this book in wraps (with the number line ending in "1" on the copyright page. Inscribed and signed on the inside of the front cover by the noted cartoonist Fred Lasswell, to his cousin. Dated in year of publication. One small crease to edge of back panel. 176 pp. Overall, a tight, clean, collectible copy.. Inscribed and Signed By Artist. First Edition. Soft Cover. VG++/No Jacket. Oblong 4to. New York: Tempo Books/Grosset & Dunlap, 1978. 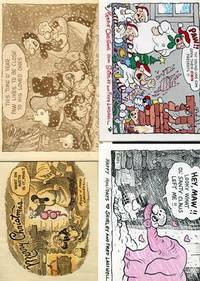 First mass-market paperback printing; six black & white comic strips from the 1940's & 1950's; unpaginated, approx. 160pp.. First Edition. Soft Cover. Near Fine/No Jacket. New York: TOR, 1981. First collected edition of black & white comic strips "A Too-Weak Vacation", "The Detective", and "A Slip in the Deep"; unpaginated, approx. 80pp.. First Edition. Soft Cover. VG+/No Jacket. Bronxville, N.Y.: The James Bond 007 Fan Club, 1981. Comic strip adaptations of "Diamonds are Forever", "From Russia with Love" and "Doctor No" in black & white by John McLusky; introduction by Richard Schenkman; color cover; 90pp.. First Edition. Soft Cover. Near Fine/No Jacket. Illus. by McLUSKY, John. 4to - over 9¾" - 12" tall. Westport, CT: Hyperion Press, Inc., 1977. 'A Complete Compilation of the First Adventures of Popeye: 1928-1930' (daily strips); Part of "The Hyperion Library of Classic American Comic Strips"; illustrated in black & white; introduction by Bill Blackbeard; 173pp.. First Thus. Soft Cover. VG++/No Jacket. Oblong Quarto. New York: Chelsea House, 1970. First Chelsea House printing; reproductions of the comic strips from 1931 to 1951; black & white with some color; edited by Herb Galewitz; introduction by Ellery Queen; 291pp. A tight, clean copy in bright dust jacket. . First Thus. Hard Cover. VG++/VG++. 4to - over 9¾" - 12" tall.